Yesterday Gigi, Sara & I went out to celebrate Gigi’s birthday that’s coming up on the 12th. We went to lunch at Gigi’s favorite restaurant Red Lobster. The entire world was waiting for a table. We were finally seated and enjoyed a nice lunch. Sara mentioned to our waitress that it was Gigi’s birthday. 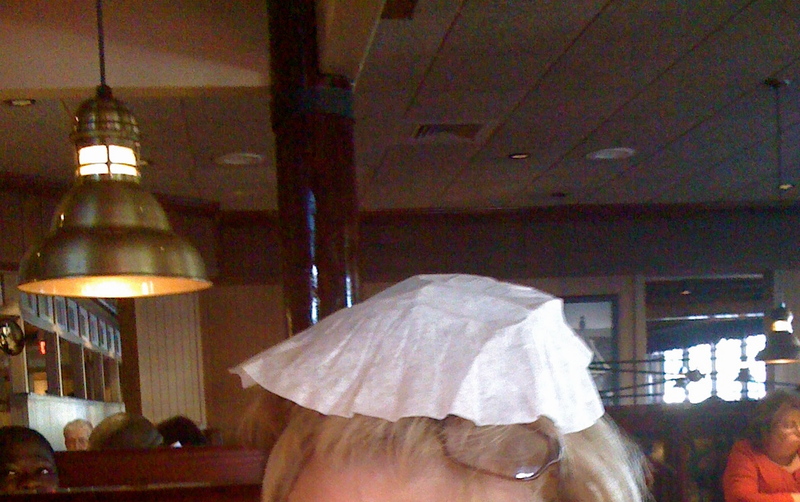 Next thing you know a bunch of servers surrounded our booth and serenaded Gigi, but only after they placed a coffee filter on her head. WTH??? What are they smoking in the Red Lobster kitchen that they think coffee filters are synonymous with birthday celebrations?? SO random!